When repairing an apartment, it is sometimes necessary to cut something. To do this, you can use an ordinary hacksaw. However, most home craftsmen, often dealing with hand tools, sooner or later prefer to replace it with an electric one. There are several varieties of electric saws. The chain model is usually used for firewood, but in order to make a long and neat cut in the wood, a circular saw is more suitable. A stationary electric saw will be very helpful in the construction of a suburban woman, since she is powerful and able to process a large amount of material. Before you go to the store and buy a tool, you need to evaluate how often you will use it. The household option will cost about two times cheaper than a professional, but it is designed for only 15-20 minutes of continuous operation, after which the engine must be allowed to cool down. 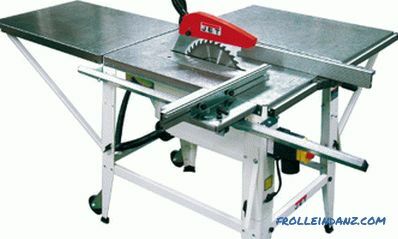 But since the electric saw has high performance, this time is enough to cut a sufficient number of pieces. If you do not work with it for more than 30 hours per month, household tools will completely satisfy your needs. It should also be borne in mind that household models, as a rule, are single-phase, and professional - three-phase, requiring mandatory grounding. Household circular is not designed to work more than 15-20 minutes. Acquire better branded products: both imported and domestic. A unit that is too cheap from an unknown manufacturer is usually of poor quality. But even a high-quality disk tool has a certain specialization, in accordance with which it is determined what type of work and material for which circular saw is more suitable. In a good saw, the disc must be parallel to the sole. Its inclination, as well as the cutting depth, are easily adjustable, the tool does not cover the surface to be machined. What matters is the method of removing dust and sawdust. Some models have a special container for their collection (for example, MAKITA 5017 RKB), others provide the ability to connect to a special vacuum cleaner or similar dust extraction unit through an adapter. Performance is improved by creating a rational system of ventilation and cooling. Do you always need to choose the most powerful tool? If you work with a circular no more than 30 hours per month, a low-power tool will do for you . The longer the circulating model must work without interruption, the more powerful its engine must be. Power for this type of tool is in the range of 500 to 2500 watts. It depends on it how easy it will be to move the disk and how quickly the motor will heat up. But the higher the power, the harder the product will turn out. And this, in turn, will significantly affect usability. Indeed, from the heavy tool hands get tired faster. Consequently, pauses for rest will still have to be done: either for the engine or for the hands. But for the increased power of the saw will have to pay more. If there is a need for long-term operation of the unit, it is fixed upside down to the table. For this there are special fasteners. With a stationary mount, not a tool is brought to the board, but the board is brought to the tool. Using such an improvised machine, you can effortlessly cut a large number of rails. Engine power, of course, in this case should be increased. Not every circular saw is equipped with fasteners, but for some models fasteners are sold separately. Therefore, choosing a heavy power tool, it would not be out of place to inquire whether there is a possibility of its stationary fastening. Some models have adjustments to the depth of cut and tilt angle. Most models allow you to make a cut with a depth of 50 to 70 mm. 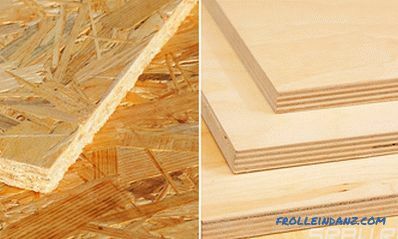 If you have to work with a board with a thickness of up to 50 mm, plywood, chipboard, fiberboard, it is better not to spend extra money and buy a lightweight compact model with a small diameter disc, about 160 mm. In more expensive devices there is a disk with a diameter of 190-200 mm, they are noticeably heavier, but at the same time, the cut provides a deeper, up to 70 mm. As a rule, a saw is purchased with a set of removable disks.They can be made of different materials, have a different shape of teeth. However, even the best tool can not install disks of different diameters. If the disk size is larger than necessary, it will not be able to fit into this design. The disk of the same diameter is smaller than required, it is simply dangerous to install. Indeed, in this case, the gap between it and the protective casing will be too wide, so that a finger could accidentally get there. When the rotational speed reaches 5000 revolutions per minute in some models, the outcome of such a hit is quite predictable. Tilt adjustment can vary from 90 to 45 degrees. A modern circular saw makes it possible to adjust the inclination of its base. Due to the inclination, it is possible to cut at an angle of up to 45 o , however this significantly reduces the depth of the kerf. So, at the maximum angle of inclination, the depth of cut is reduced by one third, that is, with a declared cut of 63 mm, its real depth will be only 42 mm. When choosing a tool, this feature should be taken into account, selecting a model with a disk of sufficiently large diameter for cutting at an angle. 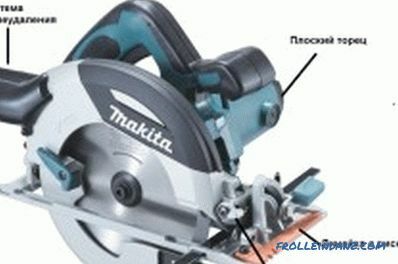 In the continuation of the topic, one cannot but mention the circular saw Worx WT431KE. It has a revolving handle in which the angle of inclination can be varied in the range from 0 to 60 o . This innovation applies only to products of the company WORX and is its proprietary development. It gives the opportunity to individually adjust the tool to any person and make his work more convenient. How to choose the right disk? When choosing a removable disk, they are guided by both the type of material and the requirements imposed on the quality of the cut. When choosing a disk for a circular, you should pay attention to the alloy from which it is made, and the shape of the teeth. Smooth, beautiful edges in it are not possible when using a disc that has carbide soldering. They are provided only by disks in which there is no soldering. The circular saw equipped with them perfectly copes with soft breeds of a tree. 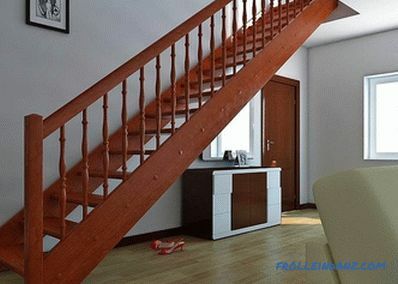 It is much more difficult to process hardwood, and if there is a nail in it, then you will have to say goodbye to the disk: it will not work with broken teeth. The tool with carbide tipped nails will be easily sawed, but the edges will not be very neat. The quality of the cut is also affected by the shape of the teeth. With a positive angle of sharpening (in the direction of rotation), which is called active, it is convenient to cut wood or plastic. Negative, otherwise - passive, the angle of grinding (against the direction of rotation of the disk) makes it possible to saw metal: tin or copper. 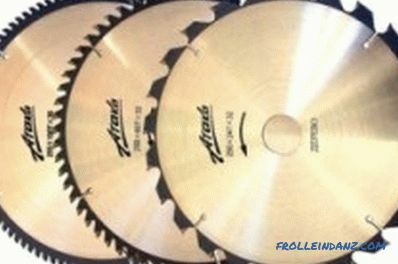 But if the saw with such a disc is used for processing wood, the quality of the cut will be low, with torn edges. For the longitudinal sawing of solid wood, it is better to choose a disk with a low number of teeth (approximately 10-28, depending on the diameter). However, when cutting wood across the grain, the treatment with such a disc will be too coarse. A high number of small teeth (from 60 to 80) will provide high-quality cutting, practically without tearing out the material, which is especially important when processing plywood sheets and chipboard. But with the increase in the number of teeth will increase and power consumption. 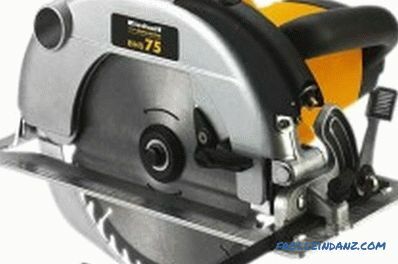 Domestic saw "Bison" is suitable for cutting wood, chipboard, fiberboard, it can be connected to Vacuum cleaner to prevent wood dust from entering the lungs. If the circular saw will not serve you as the main means of production, you can stop at relatively inexpensive tools. The products of the company "Skil" are distinguished by high accuracy of sawing, equipped with a convenient handle, light and compact. For example, the model "Skil 5740 LA" has a weight of only 2.4 kg. To models "Skil 5165 LA", "Skil 5265 LA" and "Skil 5265 LD" you can connect a vacuum cleaner or a special bag for collecting dust. The saw "Zubr ZPD 900" gained great popularity thanks to a 3 year warranty. If you do not be lazy and register on the company's website, you can get a warranty of 5 years. True, this device is somewhat heavy in comparison with similar products of foreign firms, but in terms of price and quality has a clear advantage. Universal household tools suitable for cutting wood, chipboard, fiberboard, including wet material. To prevent small particles of wood from getting into the lungs, the model developers made it possible to connect the Bison to the vacuum cleaner. 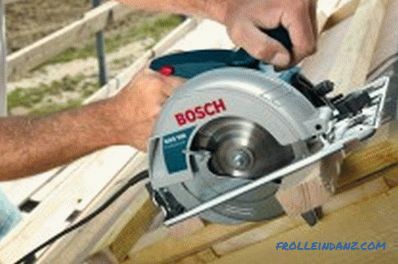 From the products manufactured by Bosch, we can recommend a household circular saw (green) and professional use (blue). Most models have turbo blown sawdust from the surface to be treated and an adapter for connecting dust extraction. Tools "Bosch" occupy a leading position in the ratio of power and weight.In addition to them, the tools from Makita and Hitachi (Japan), DE WALT (USA) are highly valued by professionals. Currently, tools are available that can work from a battery, not only in a professional version, but also in an amateur one. The widest range is presented by the company "Bosch". It should be noted that the circular saw "BOSCH GKS 36 V-LI Professional" with a lithium-ion battery has a weight of only 4. 8 kg. The Makita BSS 610 RFE tool weighs even less - 3. 2 kg. Li-Ion high-capacity batteries and a motor specially designed for working with them together ensure a long battery life. The very same battery charging takes about half an hour. A very convenient is such an innovation as a laser pointer, which allows you to make an even cut, even if the marking line is filled with wood dust and is not visible. Most models are now equipped with a built-in lighting system of the working surface. Developers pay attention to improving the security level of the tool. In particular, the disk at rest is completely closed by a pendulum casing. Its teeth are exposed only when it comes into contact with the material. 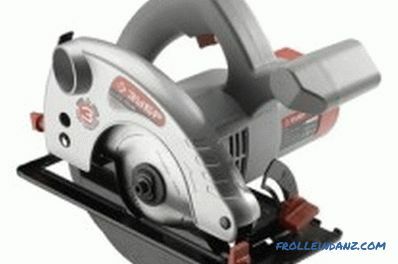 Many might be interested in the Evolution RAGE-B multipurpose circular saw. 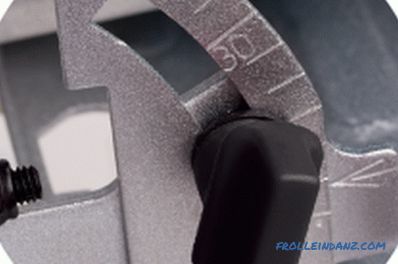 The patented technology used in the creation of this tool makes it possible to cut wood, plastic, aluminum, steel sheet up to 6 mm thick with a single disc. By changing the universal disk to diamond, the same device can be cut brick, stone and concrete. The depth of cut is adjustable, its maximum value - 60 mm. 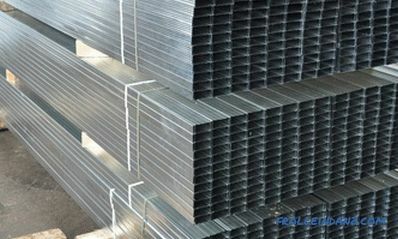 The inclination of the cutting can also be adjusted from 0 to 45 o . Relatively recently, a tool called "Rotorazer" went on sale, which combines the functions of a jigsaw, circular saw, band saw, hacksaw and tile cutter. Replacing the blade in it is quite simple to rearrange, and many willingly use the new product for simple repair work. 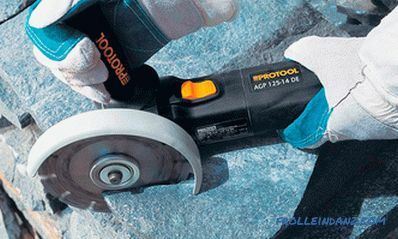 With materials thicker than 12 mm, the tool does not work, but it cuts almost everything from carpet to stone.